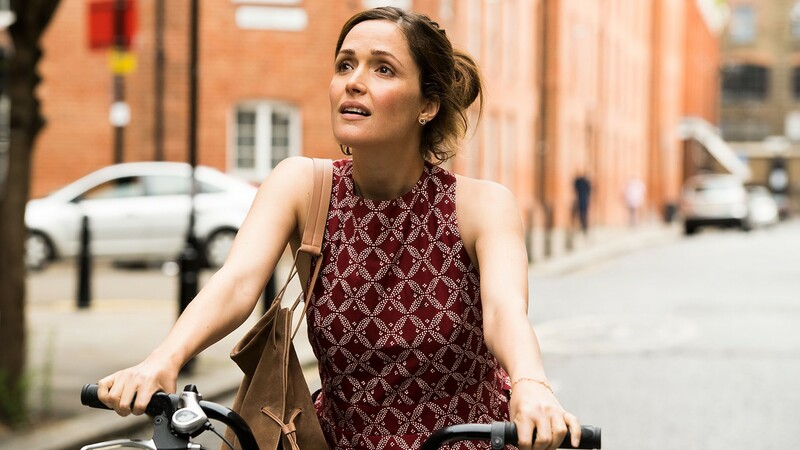 Rose Byrne comes into her own in Juliet, Naked. To watch a movie or read a book written by Nick Hornby is to enter a sphere where all the problems are manufactured by humans, as are the solutions. And there's almost always a solution. In Hornby's world (Brooklyn, Wild, About a Boy) monsters do not pop up out of nowhere and devour cities, and vacations hardly ever turn deadly. People tend to resolve their issues by sitting around discussing them. Embarrassment and the occasional heartbreak may occur, but not every day, and very rarely with fatal results. Hornby's characters don't exist in a warm and fuzzy cocoon, yet we're always happy to tag along with them because we know from the outset that no one is going to suffer lasting harm. The situations tend to be almost cozy in their familiarity — only the individual personalities are new and unusual. So it is with the Hornby adaptation Juliet, Naked, the story of an unfulfilled woman and the imperfect men in her life. Annie (Rose Byrne), her partner Duncan (Chris O'Dowd), and odd man out Tucker Crowe (Ethan Hawke) inhabit the classic "Hornby Golden Triangle" — movies, books, and music are practically all they ever think about. Annie, outwardly a portrait of calm equanimity yet inwardly seething, tends a small museum in the sleepy English seaside town of Sandcliff (don't go looking for it; it doesn't exist). In her spare time, she wonders why and how long she'll remain with daffy Duncan, whose lifetime mission is the obsessive study of obscure American rock singer-songwriter Tucker. Duncan has a spare room devoted to Tucker plus all his records (so he thinks), but has never met him. Naturally Annie is bored to tears with Duncan as well as with the mere mention of Tucker. But that is before she semi-accidentally forms a pen pal relationship with the mostly forgotten rocker. Juliet, Naked is long on awkward conversations and harmless joshing. Director Jesse Peretz adapted Hornby's 2009 novel, assisted by the team of his sister Evgenia Peretz, frequent Alexander Payne writing partner Jim Taylor, and screenwriter Tamara Jenkins (The Savages). The game consists of Annie's slow awakening, contrasted with Tucker's cavalier self-absorption and Duncan's perpetual cluelessness. It's a case of men-children in the promised land, falling in line behind a woman who's only now beginning to realize her potential. Tucker's fawned-over "comeback" album is actually pretty unremarkable, an acoustic thumb-sucker several notches on the food chain beneath Townes Van Zandt. It goes along with Tucker's life in the U.S., teaching English lit and stage-managing a corral full of exes and offspring. Hawke excels at this particular type. He's good at middle-aged guilt, huggy regrets, and the sweet agony of missed opportunities, endlessly mulled over (see Richard Linklater's Before trilogy). Tucker is cool even when he's disorganized, just the sort our Annie needs. This is made obvious when he suddenly commandeers the film with one move — a sad, impromptu solo rendition of Ray Davies' "Waterloo Sunset." That's the advantage of having Hawke in a wistful drama like this. He can turn it on a dime.